We are semi-retired professionals (law and journalism). We have a beautiful yacht and go to the reef and islands frequently. We know a lot about Port Douglas and the reef and we provide and extensive insiders guide to our guests. Value for money. The reef and the rainforest. Owners give you an excellent insiders guide so you get the best out of your holiday. We tell you what you can do own your own easily and which tour operators do which things for which sort of people. Short walk to beach. Path goes through 50 metres of rainforest before opening to beach. You park under the roofline out of the tropical sun and tropical rain. 6 bath towels and 6 beach towels are provided. Very well-equipped kitchen. Easily cook big dinner for six. Well appointed. Dishwasher. Oven. 4 plate cooktop. A dozen or so DVDs. We also run Unit 2. Feel free to swap videos with any guests there. Dinning area for six outside. Golf course in walking distance. Plunge pool. 3m at widest. 1.6m at deepest. Close to Great Barrier Reef and Daintree Rainforest. We provide a comprehensive guide pointing out what you can do yourselves and which reef tours are best for which sort of people. Also guide on shopping etc. Wow, what a great place! Extended family of six staying. We really enjoyed our time there. Modern, well kept facility with all that we needed for our 9 day stay. Much nicer than one of the local resorts. A couple minutes drive from the supermarket and the junction to the Cook Highway. Perfect base for exploring the area. The owner was very quick to reply to communications. Highly recommend that people stay here. It was our first time in Port Douglas, and this rental was just what we needed. Plenty of space, with three bedrooms, and 2 and 1/2 baths. The beds are very comfortable, and the downstairs living space nice to lounge, and dine, and relax. All rooms had air conditioning, which is nice in the Summer. The owner is very friendly and helpful. The rental is very close to downtown, so very convenient. We had a great stay at Crispin's house. Very comfortable, close to the beach and downtown for shopping and reef trips. His visitor guide is top notch, great suggestions and the markets were very nice. We had 5 people and were very well accommodated. So much to do in the Port Douglas area, I wish we could have stayed longer. Ruby Reef is exactly as described, we enjoyed our stay here and would recommend it. 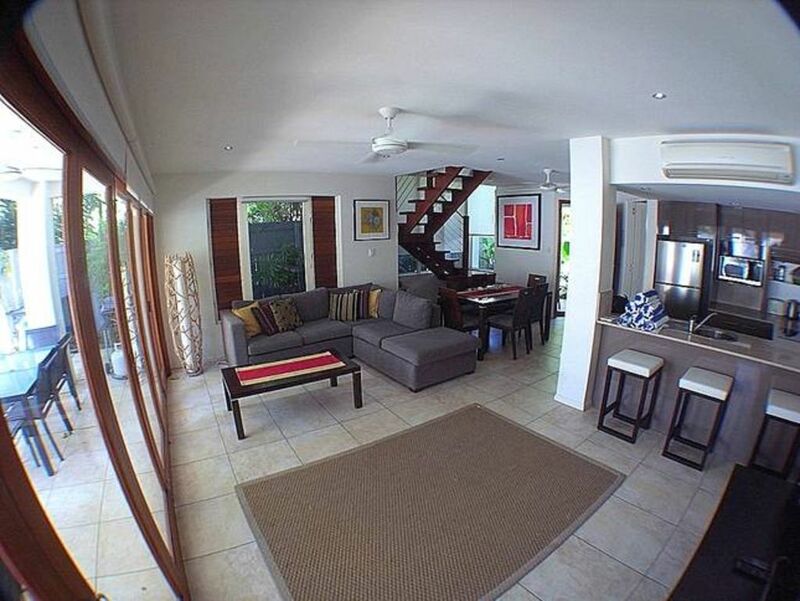 We would recommend this property for anyone staying in the Port Douglas area. The road from Carins to Port Douglas is very narrow and twisty in some areas which can make driving a bit daunting but on the other hand the scenery is quite beautiful. The accommodations are very comfortable , any problems that arose Chrisin was there to take care of it immediately . This property was perfect for our group, with plenty of room, tastefully furnished and well-equipped. The plunge pool was fantastic. As we had a car, the 8min drive to Macrossan St was no issue and parking in the main street was always available. The neighbourhood was very quiet and peaceful and it was lovely to hear all the wildlife in the evening and early morning. The only issue we had was that on the day we were due to reach Port Douglas, we hadn’t received any info about how to access the property and a call to the owner’s mobile resulted in a voicemail to say he was overseas. However, i contacted Stayz and the Stayz staff connected me with the secondary contact and in the end we were able to access the property with no problem. I would definitely recommend this property to others but would also recommend that they insist on getting the access information well before time, as it was a bit stressful not knowing what was going on and thinking we might have to find emergency accommodation during school holiday time. We send a map, wifi connection details and the best insiders guide to port douglas you can imagine to all our guests the moment their booking is confirmed. The guide (we take no commissions) outlines the things you can do on your own and which reef trip is best for which sort of people: divers, snorkelers, family, non-swimmers etc. We have lived here for 10 years and know the area. We give our guests the very best advice very promptly. I can only assume that our email containing all this information went into their spam box. Every other guest raves about the information pack we always provide. Read all the other 5 star reviews about this villa, which even these guests say is wonderful despite the minor communication problem. We loved staying at ruby reef. It wss the perfect set up for our family. The little touches with the stair gate and the stroller were perfect. The indoor outdoor dining was perfect we ate every meal outside. Only thing we missed was a coffee/pod machine.